After breakfast, Kim and I headed down to the basement to get things situated while we waited for Adam to arrive. Since he was held up with traffic on the expressway (at 9am on a Sunday, its Atlanta, go figure) I started with getting the e-brake cables attached to the rear calipers. In my head this was a relatively straightforward process but it turned out to be anything but. To start with, I backed off the white adjustment knob attached to the e-brake cable mounted on the diff to give me more slack to attach the end of the cable to the caliper. Despite giving it a good amount of slack, the square end of the e-brake cable just would not attach to the clip on the caliper. Gave it even more slack and still no go. Huffing and puffing, I pried, pushed, swore, bribed, cajoled, and generally cursed the design of this thing until finally I just gave up in frustration. After a short trip to the toolbox and returning with a set of big adustable pliers, needlenose, screwdrivers, some sockets, and a foul temper, I set about taking the spring off the caliper which was easy enough – just undo the one 8mm bolt and the spring will pop out. From there, it was relatively easy to get it attached. But then you have to get the spring re-attached and those things are under some serious tension. Pulling, pushing, prying, with the pliers and with Kim helping it finally slotted itself back into the retaining groove. One down. Right about then Adam showed up with Heather and Venice (wife & 18 month old daughter) so Kim excused herself to go chill with the girls while Adam and I tackled the other side of the car. I explained to Adam what I’d done on the right side, and very emphatically explained what I thought about the design, and after a couple minutes looking at it we agreed we’d just pop off the spring like I’d done on the other side. After doing that we still couldn’t quite get it to attach. About this time I suddenly realized I could just undo the handbrake from the chassis and get even more slack. After doing that it popped right on, no issues. For whatever reason getting the spring back on was much simpler on the left side too. Then we re-attached the handbrake to the chassis. I think that was the 4th time I’ve taken it off and put it back on during the build (so far). With that done we set about putting the hub nuts on since I’d acquired the 41mm socket we needed and the larger torque wrench. And we hit another WTF moment quickly thereafter. The 41mm socket fit the left side of the car perfectly, but wouldn’t fit over the hub nut on the right side. Perplexed I pulled out the Vernier caliper and measured 41.3mm rather than the 41mm we needed for the socket. It was literally just that tiny bit too big. Sighing in frustration we agreed I’d go to Sears after lunch and get a 1 5/8″ socket which was just slightly bigger than the 41mm the manual calls for. Ironically, I’d been to Sears just yesterday to get the 1/2″ to 3/4″ adapter we’d need for the larger torque wrench to attach to the 41mm socket and happened to notice they had a 1 5/8″ socket on the shelf. With the back end on hold again we switched off to focus on the engine. Last time we’d left the engine broken down with oil pan removed, camshaft timing sprockets un-attached, and valve cover off. I’d ordered the TDC tools we needed from Amazon, Lisle 37410 Camshaft Alignment Kit for $26, and they worked as advertised. We put in the camshaft shim and TDC pin then took off the timing cover as the Haynes manual instructed. 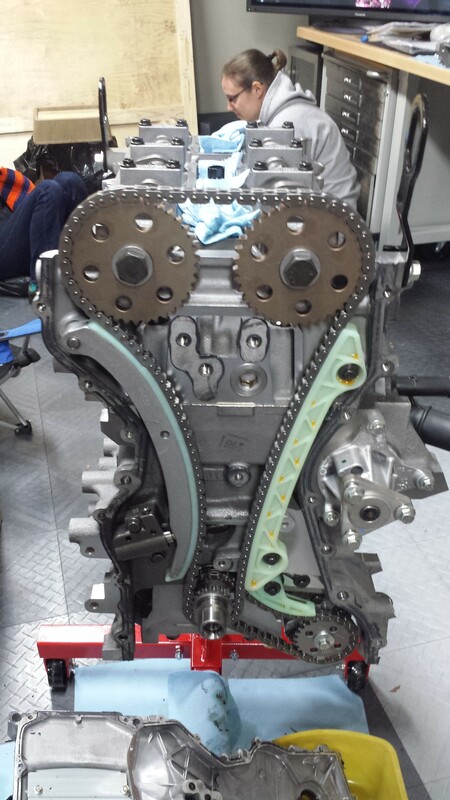 We adjusted the tensioner, put the timing sprocket on the camshaft, then set about cleaning off all the mating surfaces. I couldn’t find the razor blades so made due with the scraper I’d bought at Sears and some plastic scrapers I had in the drawer. After a bit of cleaning we re-attached the timing cover, being careful to tighten in sequence to 89 inch-lb for the small bolts and 13 ft-lb for the large ones. With the timing cover and timing sprockets back into place we tightened up the camshafts to 53 ft-lbs. At this point we moved to the oil pan and finished torquing it down since I’d only loosely put the bolts on prior. Once the oil pan was ready, we applied the black high-temp gasket sealant in the right shape then attached to the bottom of the engine. It seemed easier to come from bottom up rather than top down to keep the metal/rubber O-rings from moving around on us. We attached with the bolts provided and torqued to 18 ft-lbs for the oil pan to crankcase and 89 in-lbs for the timing cover to oil pan bolts. Note, there were not bolts provided for the timing cover to oil pan so we re-used the ones we’d removed from the engine. Also, two of the provided bolts stripped out on us. We re-used two of the previous bolts from the stock oil pan with no issues in lieu of those. With the bottom done up, we moved on to the spark plugs. These were torqued down to 108 in-lbs. I couldn’t find any from Caterham so we re-used those that came with the engine. It’s a new crate engine so figure they’re fine otherwise I’d have purchased some new ones. The valve cover was then re-attached and torqued to 89 in-lbs. Coil packs, new from Caterham, were then installed over the spark plugs and torqued down to 89 in-lbs. There wasn’t a spec in the Haynes manual but since most of the other similar size sockets were 89 in-lbs it was a safe bet. With the engine buttoned up we called it a day. The girls were hungry and I was in a state of being overwhelmed. While digging through the box of engine parts from Caterham I realized just how much more reading I needed to do before tackling everything and wasn’t ready to move ahead. My closing thought of the day is I really, really, REALLY hope we did the engine right. I’d hate to get this thing in the car, blow it up, or have to take it back out because we’d not assembled something right. It’s quite disconcerting.